WASHINGTON — Kirstjen Nielsen, the homeland security secretary, resigned on Sunday after meeting with President Donald Trump, ending a tumultuous tenure in charge of the border security agency that had made her the target of the president’s criticism. Nielsen had requested the meeting to plan “a way forward” at the border, in part thinking she could have a reasoned conversation with Trump about the role, according to three people familiar with the meeting. She came prepared with a list of things that needed to change to improve the relationship with the president. The move comes just two days after Trump, who has repeatedly expressed anger at a rise in migrants at the southwestern border, withdrew his nominee to run Immigration and Customs Enforcement because he wanted the agency to go in a “tougher” direction. 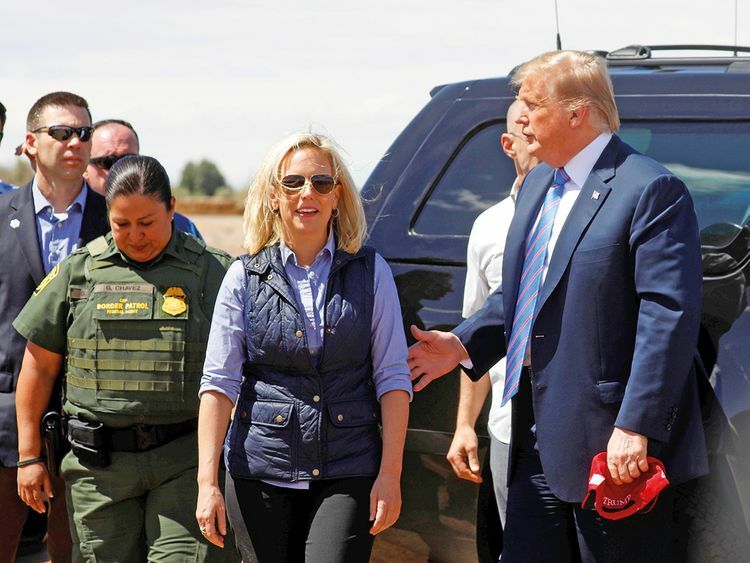 Trump in recent weeks had asked Nielsen to close the ports of entry along the border and to stop accepting asylum-seekers, which Nielsen found ineffective and inappropriate. While the 30-minute meeting was cordial, Trump was determined to ask for her resignation. After the meeting, she submitted it. Trump has ratcheted up his anti-immigration message in recent months as he seeks to galvanise supporters before the 2020 election, shutting down the government and then declaring a national emergency to secure funding to build a border wall, cutting aid to Central American countries and repeatedly denouncing what he believes is a crisis of migrants trying to enter the country. Nielsen said on Twitter she plans “to stay on as secretary through Wednesday” in order “to assist with an orderly transition.” The abruptness was unusual because the Department of Homeland Security currently does not have a deputy secretary, who would normally take the reins. The president said in a tweet that Kevin McAleenan, commissioner of Customs and Border Protection, would take over as the acting replacement for Nielsen, who became the sixth secretary to lead the agency in late 2017. But by law, the undersecretary for management, Claire Grady, who is currently serving as acting deputy secretary, is next in line to be acting secretary. The White House will have to fire her to make McAleenan acting secretary, people familiar with the transition said. Grady has told colleagues that she has no intention of resigning to make way for McAleenan. Among the possible replacements for Nielsen in the long term is Ken Cuccinelli, the former Virginia attorney general who is a favourite among conservative activists and who fits the profile Trump wants the next homeland secretary to have, people familiar with the discussions said. Nielsen had been pressured by Trump to be more aggressive in stemming the influx of migrant crossings at the border, people familiar with their discussions in recent months said. Her entire time in the job was spent batting back suspicion from the president, even as he told people he liked how she performed on television and enjoyed dealing with her personally. He initially was sceptical because of Neilsen’s previous service in the George W. Bush administration, and then because she was close to John F. Kelly, the president’s former chief of staff. The president called Nielsen at home early in the mornings to demand that she take action to stop migrants from entering the country, including doing things that were clearly illegal, like blocking all migrants from seeking asylum. She repeatedly noted the limitations imposed on her department by federal laws, court settlements and international obligations. Those responses only infuriated Trump further. The president’s fury erupted in spring 2018 as Nielsen hesitated for weeks about whether to sign a memo ordering the routine separation of migrant children from their families so the parents could be detained. 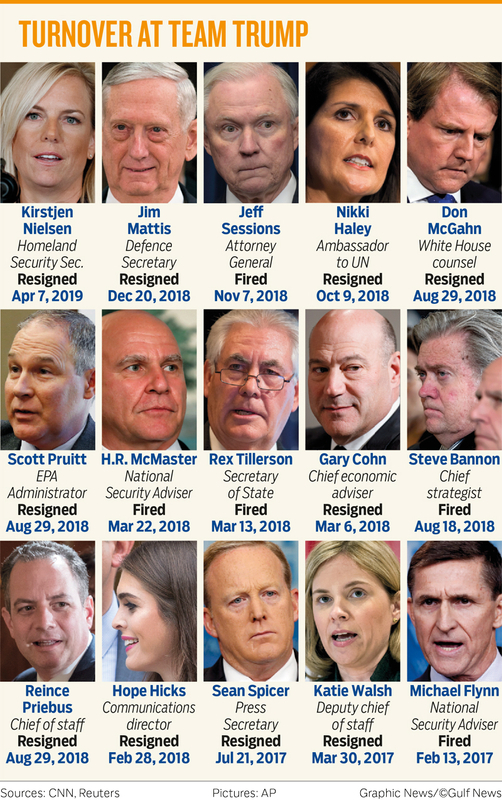 In a Cabinet meeting surrounded by her peers, Trump castigated her repeatedly, leading her to draft a resignation letter and to tell colleagues that there was no reason for her to lead the department any longer. By the end of the week, she had reconsidered and remained in her position, becoming an increasingly fierce supporter of his policies, including the family separations. While Trump often blamed Nielsen for the surge in migrant crossings, she will be remembered for leading the department during the Trump administration’s “zero tolerance policy” at the southwestern border, which initially resulted in the separation of thousands of migrant children from their families. Trump eventually moved to halt the family separations, though the government struggled in some cases to reunite those it had already separated. The Department of Homeland Security, which has a budget of more than $40 billion and more than 240,000 employees, is an amalgam of 22 government agencies that was created after the Sept. 11, 2001, terrorist attacks. It is responsible for everything from protecting the nation from cyberattacks to responding to natural disasters.